Whether you are new to Shopify or already running your business there, one of the most important things is that your store is working as fast as possible. You have to make sure that you provide your customers with the perfect user experience. Usually people start by installing all kinds of apps, that are available on the Shopify store, which promises significant performance improvements, better SEO and Google ranking and so on, but actually, in most cases, it just makes things even worse. With that being said, you have to make sure that you inform yourselves about the app before actually install it and try it because it can cause damages even in a short period of time. One of the recommendations for any Shopify store is to provide AMP version of all the pages. It's even mentioned as one of the crucial points for improving store performance and SEO, in lots of online articles. For those of you, not familiar with AMP let's say a few words about this technology so that you get a better understanding of why it's important to have this. AMP is an open-source library that provides a straightforward way to create web pages that are compelling, smooth, and load near instantaneously for users. AMP pages are just web pages that you can link to and are controlled by you. You can read more here. OK just another definition but what is the actual benefit from using AMP? Good question. AMP pages are really fast, almost instant, so your customers won't wait at all for the page to be loaded. This happens because all AMP pages are already cached on Google servers, so the loading speed is not an issue anymore. But, the main benefit is that Google adores AMP pages and puts them very high in the search results, which means greater the chances that people will find your stores. This potentially leads to more traffic and better conversion rate. Which app to use for AMP? This is where AmpifyMe steps on the scene, as the ultimate AMP application on the Shopify. The reviews are also telling the same story. You will probably ask yourselves, why is that? 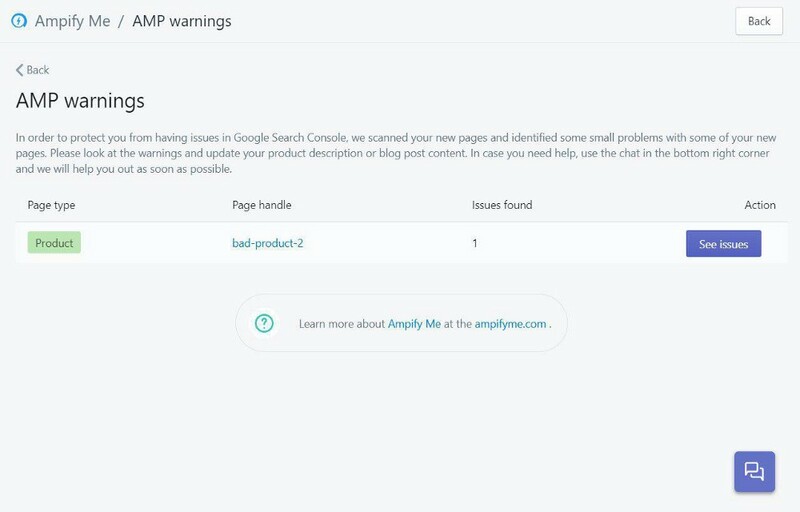 Well not only that AmpifyMe generates AMP pages for your store and offers a bunch of other features, but also pays close attention that every aspect of the application works perfectly and that it brings only benefits from its use. That means that every single AMP page this app produces is 100% valid. The first and most important thing about any AMP page is that is valid. Simple right? Well not really. You have to check somehow if your pages are valid. One way is manual, where you copy/paste all the links to the AMP checker and get the response. Sounds like a lot of work, right? 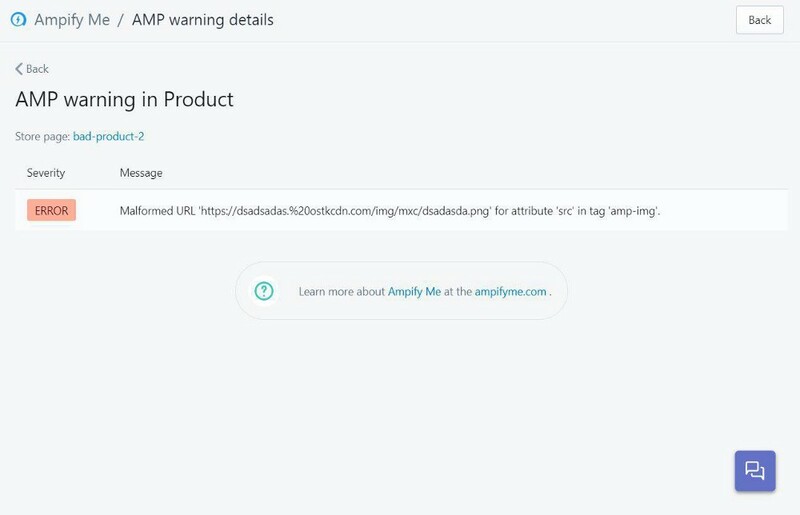 That is why only with AmpifyMe app, you get a dedicated section inside your Shopify admin, for checking status on your AMP pages. With a few clicks, you will always be up to date and you can react quickly if you see some problems there. Absolutely. Not only that your store won't gain any traffic from invalid AMP pages, but will also suffer from lowering down Google rank and not being shown at the relevant place in Google search. Yes, this is the price you will pay if you don't make sure that your store is serving only valid AMP pages. Overall you will lose potential customers and profit. It's left up to you to decide about the importance of this aspect of your store.